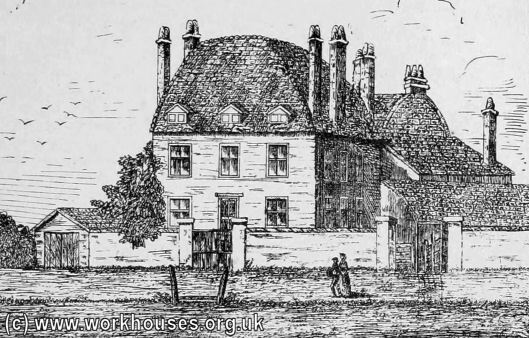 According to the 1732 edition of the workhouse directory, An Account of Several Workhouses..., a workhouse was erected in Camberwell in 1728 near the parish church. In 1813, the parish of Saint Giles Camberwell obtained a local Act of parliament which provided "for repairing or rebuilding the Parish Workhouse, and purchasing Ground for a Cemetery". Camberwell old parish workhouse, 1875. Camberwell was formally constituted as a Poor Law Parish on 28th October, 1835. Its operation was overseen by an elected Board of Guardians, 15 in number. The population falling within the Parish at the 1831 census had been 28,231. The average annual poor-rate expenditure for the period 1833-35 had been £15,930. At various times, Camberwell made use of three main workhouse sites: Havil Street, Gordon Road, and Constance Road. The workhouse at Havil Street was erected in 1818. It was a long, narrow building of brick, two storeys in height, besides the basement. Some additions to the site in 1847. 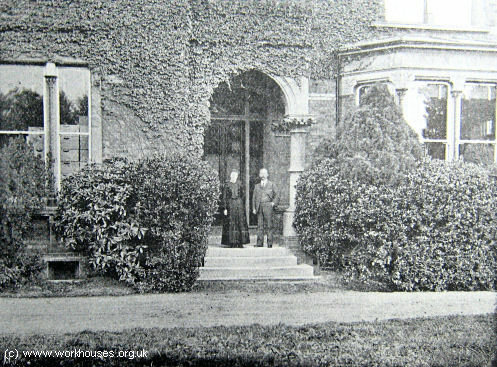 The infirmary urgently needed to be rebuilt. The old and infirm ought to be classed and treated as sick. The lying-in ward was entirely unfit for its purposes, and needed urgent attention. Properly trained and paid nurses ought to be appointed to look after the sick. The status and pay of the medical officer should be improved, and a qualified medical assistant should be appointed. The drugs ought to be supplied and dispensed at the guardians' cost. The dietaries should be revised, and more animal food allowed. Over the years, the site became increasingly important as a hospital. In 1873 a large new infirmary was erected at the north of the site, at the junction with Brunswick Road. Its central administrative block was five storeys high and contained offices, staff accommodation, and special wards. To each side were three storey wings, for men at the north, and women at the south. The layout of the workhouse is shown on the 1875 map below. Camberwell, Havil Street workhouse site, c.1875. 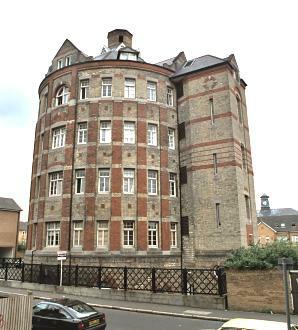 In 1889-90, a new circular ward tower, a design then in vogue, was added at the east fronting onto Havil Road at a cost of £14,665. Each of its four storeys contained 24 beds radiating around a central shaft in which were located the buildings heating and ventilation services. Camberwell, Havil Street, circular ward block, 1890. Camberwell, Havil Street, circular ward block, 2001. 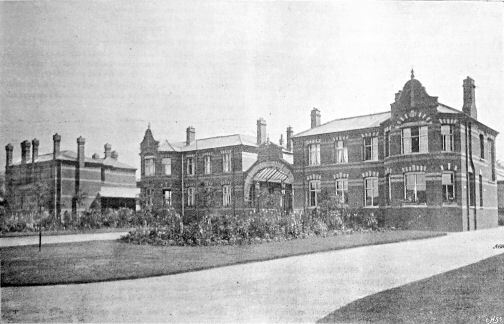 The infirmary building were further extended in 1899-1903 with new ward blocks, operating theatre, and nurses' home. A large administration block fronted onto Brunswick Square (now St Giles Road). New Guardians' offices were erected at the south-east of the site. 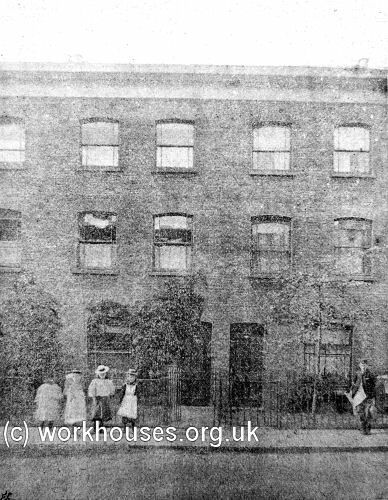 Camberwell, Havil Street workhouse site, 1914. Camberwell, Havil Street, 1903 ward block from the east, 2001. Camberwell, St Giles Road administrative buildings from the south, c.1908. In 1930, the Havil Street site was taken over by the London County Council and renamed St Giles' Hospital. Many of the original buildings have now been demolished to make make way for a residential development. In 1878, Camberwell erected a new workhouse at a site to the west of Gordon Road. Its design was opened to competition and the winning plans were submitted by Berriman and Sons Ltd. Their design comprised a central administrative block connected by covered walkways to two dormitory pavilion blocks. Camberwell, Gordon Road workhouse site, 1888. 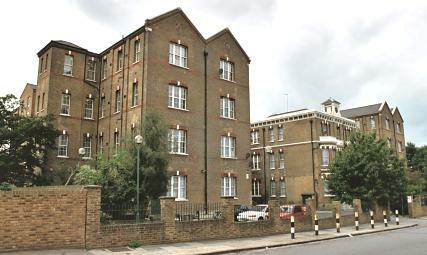 Camberwell, Gordon Road, from the south-east, 2001. Camberwell, Gordon Road, from the south-west, 2001. The Gordon Road workhouse was originally intended to house only for able-bodied inmates, of which it could house 743. Male inmates performed stone-breaking and wood-chopping, while the women were mostly employed in laundry work. In 1930, the Gordon Road site was taken over by the London County Council and became the Camberwell Reception Centre. The administrative block and two main pavilion dormitory blocks survive and have now been converted to flats. In 1892, work began on an additional workhouse at Constance Road (now St Francis Road) in East Dulwich, just to the north-west of the St Saviour's union infirmary at East Dulwich. The site housed 1,000 inmates, mostly aged and infirm, plus some lunatics. There was also a small block for married couples. The buildings, which were opened in 1895, were designed by Thomas Aldwinckle and the builder was Messrs Higgs. The workhouse location and layout is shown on the 1914 map below, by which time it was officially known as the Constance Road Institution. Camberwell Constance Road site from the north, c.1896. At the centre of the site was a large administration block, two storeys high, and entered through a large central archway at the north-east. Four-storey dormitory pavilion blocks lay to each side. There was also a small chapel. Camberwell Constance Road, administration block from the east. Camberwell Constance Road married couples block, c.1896. 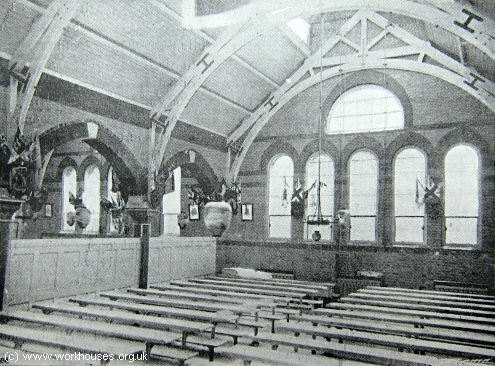 Camberwell Constance Road dining hall interior, c.1896. 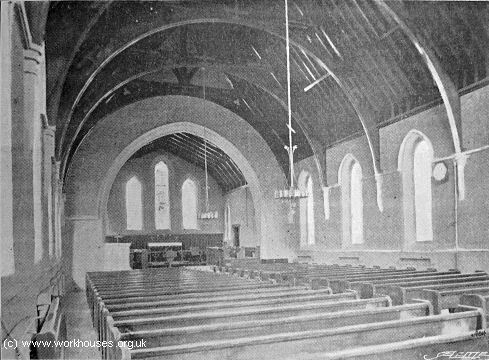 Camberwell Constance Road chapel interior, c.1896. Camberwell Constance Road, mortuary interior c.1930. 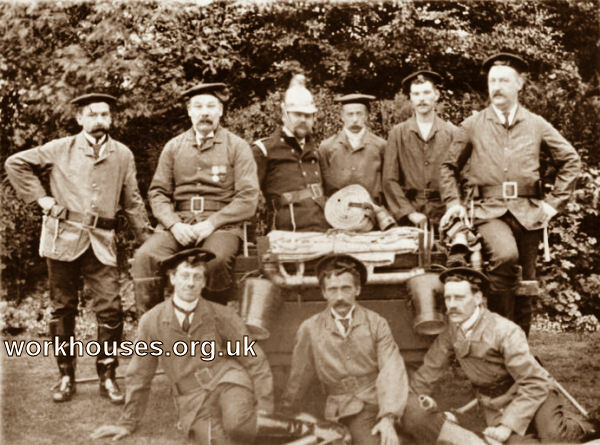 Like a number of large workhouses, Constance Road had its own fire-fightin team made up of of male members of staff who were given training by the local fire brigade. Camberwell Constance Road fire brigade. From 1891, inmates from Camberwell's workhouses had an annual summer excursion to the seaside. For their 1896 day out to Bognor Regis, a special 650-seat train was chartered and at around 9a.m. the party, set off. The group consisted mostly of elderly inmates aged 60 to 90, together a number of young children from the workhouse. They were also accompanied by a boys' band from the South Metropolitan School for pauper children. Dinner and tea were provided at the Bognor Town Hall after which the men were given tobacco, and the women and children sweets. However, many of the group had apparently obtained money from their friends and after being liberated from the workhouse had headed straight for nearest public house before boarding the train. On arrival at Bognor, they had continued drinking, and had then gone for their dinner at which beer was also served. After dinner, there were more visits to the local public houses. It was later reported that a number of cases had occurred of disorderly conduct and indecent behaviour on secluded parts of the beach. 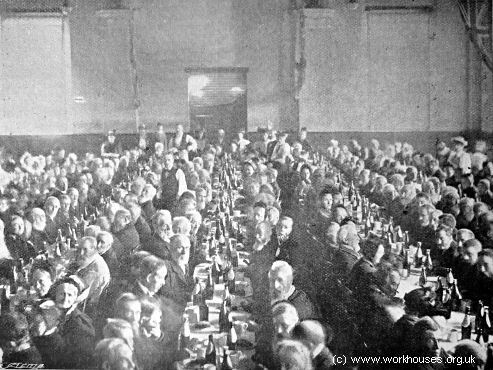 A photograph of the inmates at their official dinner shows that beer was indeed served. After 1930, the Constance Road site was taken over by the London County Council and renamed St Francis Hospital. 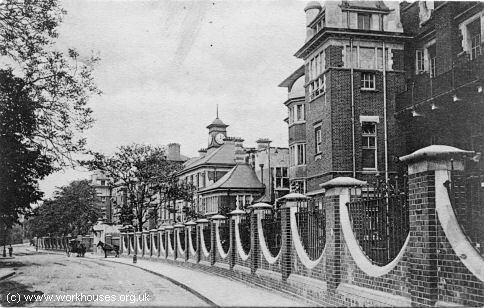 It then became Dulwich Hospital North Wing, and was connected to its parent hospital (the former St Saviour's infirmary) by a subway under the railway line that lay between them. 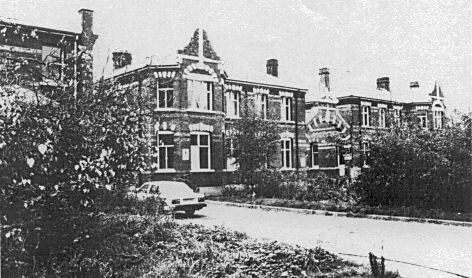 The hospital closed in 1991 and the buildings were subsequently demolished to make way for a modern housing estate. 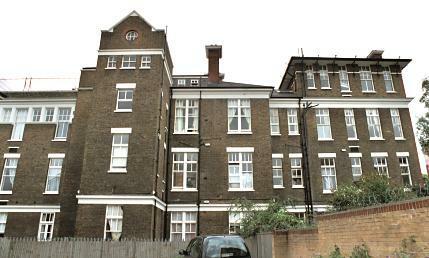 In 1894-95, the former Birkbeck Schools on Willowbrook Road, Peckham (TQ338776) were used as a temporary workhouse by the Parish. In June 1898, Camberwell set up London's first children's scattered homes following the scheme devised in Sheffield to house children in small family groups in ordinary urban houses. 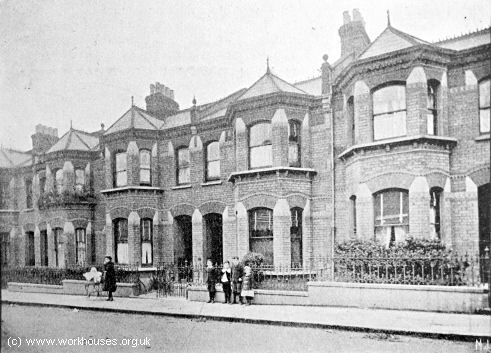 Camberwell initially rented two houses on Heaton Road, Peckham Lane, where around twenty children from "in-and-out" families were placed under the care of two foster mothers. Camberwell Heaton Road homes, c.1898. Five further homes were added in January 1899: two in Crystal Palace Road, one in Lordship Lane, and two in Melbourne Grove, Dulwich. By 1903, thirty-one scattered homes were in use. In 1908, the locations included: 18-20 Ashbourne Grove; 2-4 Barforth Road, Nunhead; 200-202 Barry Road; 1 Burnaston Terrace, Grove Vale; 59-63, 262, 272, 297-299 and 341-343 Crystal Palace Road; 14 Derwent Grove; 6, 24-26, 209, 263 and 267 Friern Road; 335 Lordship Lane; 29 Marsden Road; 1-3 and 9-11 Matham Grove; 71 Melbourne Grove; 1-4 Rye Road; Peckham; 197-199, 306, 322 and 326-8 Upland Road, . Headquarters homes for the scattered homes was set up in a house called Newlands on Stuart Road in Peckham Rye, and at 19 Zenoria Street, East Dulwich. Camberwell Newlands headquarter homes, c.1899. The Newlands site is now occupied by Bredinghurst Special School. Havil Street workhouse holdings include: Births (1837-94); Deaths (1837-94); Creed registers (1886-91); Registers of children emigrating (1893-1926); etc. 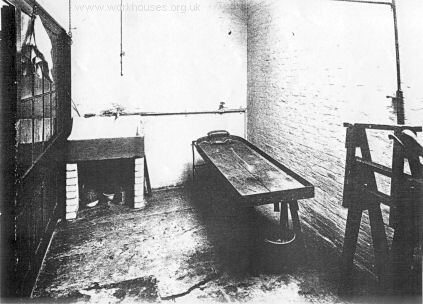 Gordon Road workhouse holdings include: Admissions and discharges (1880-1); Creed register (1879-1930); Register of casuals (1905-10); Offences and punishments book (1914-37); etc. Constance Road holdings include: Births (1894-1926); Deaths (1895-1929); Admissions and discharges (1894-1928); Creed registers (1915-20, 1927-31); Registers of inmates (1897-99, 1915-22, 1925-30); Registers of emigrants (1893-1926); Register of servants (1900-30); etc. Newlands Home: Registers of children (1904-26); Scattered homes registers (1898-1936); Registers of children emigrating (1893-1927); etc. Other holdings include: Guardians' minute books (1835-1930); Financial records (1857-1928); Staff records (1870-1930); etc.